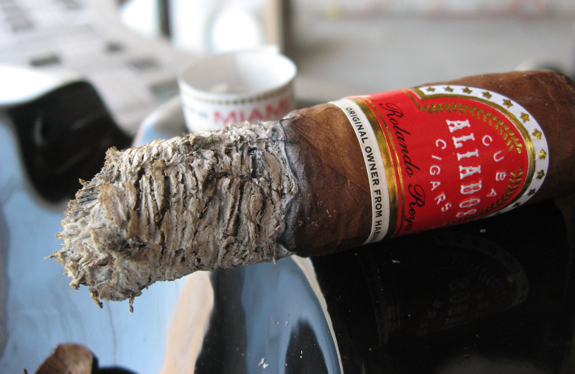 The Cuba Aliados line of cigars is produced by the Reyes Family Cigar company. At the head of the Reyes family is Rolando Reyes, born and raised in Cuba and emigrated to America when he was almost 50. 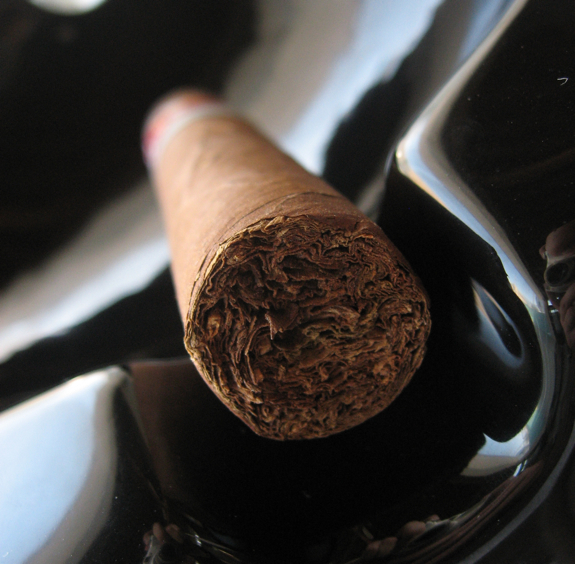 He had a long history of cigar making and rolling from when he was very young. The history of his career is very interesting, including a harsh government seizure of his brand and assets in 1968. I highly suggest reading about the history on the Reyes family website. 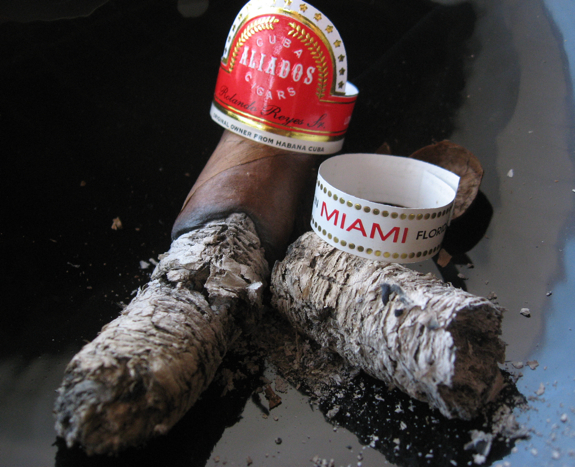 The cigar we are reviewing today is the Cuba Aliados Miami. 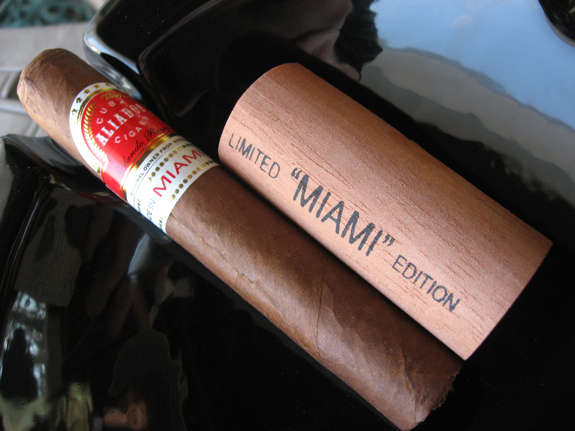 This is a special edition cigar that is rolled in the Miami, Florida factory. Each cigar comes packaged in cellophane and wrapper with a stamped cedar sheet. One thing I found odd was that the cedar was not secured in anyway, so as soon as it came out of the cellophane the cedar fell off. 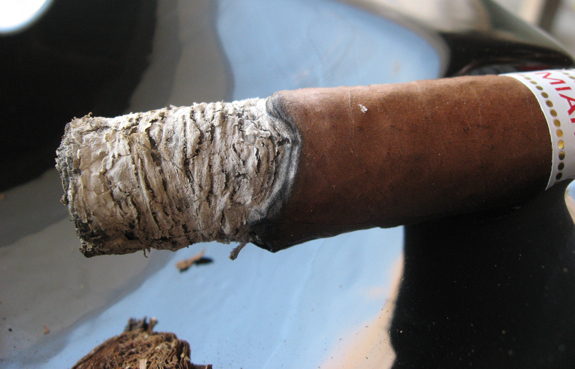 There isn’t too much information out there on this cigar. What little I did find was that the rest of the Cuba Aliados line is produced in Honduras and this special edition cigar is the only one rolled in the Miami factory. I do know we don’t really talk much about the Reyes Family of cigars but they are a fairly large producer and have a strong variety of lines. I’ve had a chance to smoke a few from their selections and although none have really stood out, none have been poor either. So let’s see how this one does and get on to the review. I’m on the fence with this cigar. 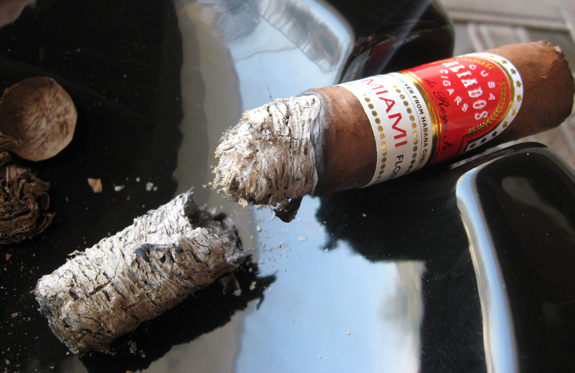 It started out as a nice smooth and fairly mild cigar with some good cedar flavors. 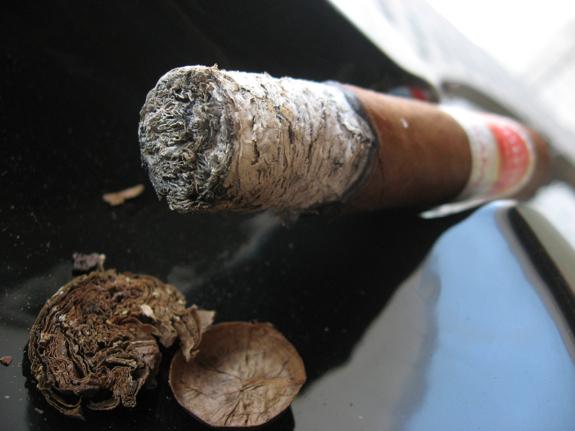 As the body picked up near the end of the cigar I found that the balance was thrown off a bit. The flavor profile suggested a light early day cigar but the stronger body started to drown out or overpower the flavors. They also didn’t change a whole lot and the bitterness at the end was a disappointment. I’ll note that the intensity of this bitterness wasn’t the same as my previous experiences with this cigar, but it was always present. I think this cigar would have been a much better smoke if it stayed mild or if it had some more intense or flavorful notes to balance it out. that’s not to say I didn’t like most of what it had, it just didn’t seem to be as balanced as I would have hoped. It’s still worth trying a few of these as the construction was nice and the price isn’t bad either. 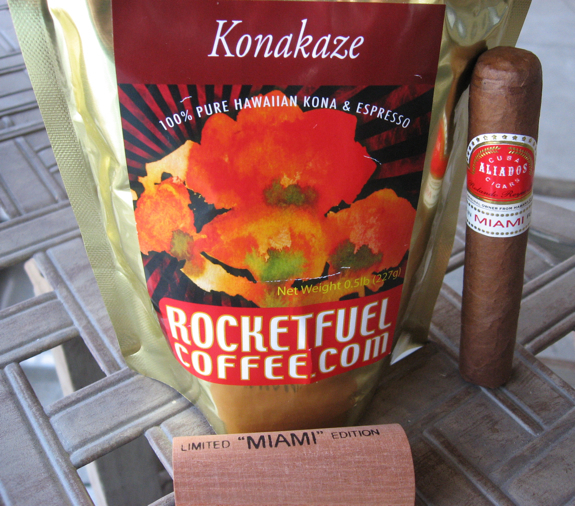 It was earlier in the day when I went outside to enjoy this cigar so I decided to sit down with some coffee. I also brewed a pot for review with the Carmelo Red Label not too long ago. It’s an interesting light and bold blend of Hawaiin Kona and Espresso beans making for a mouthful of flavor. It paired nicely with most of this cigar but I think something more bold would have been better near the end as the body of this cigar ramped up. 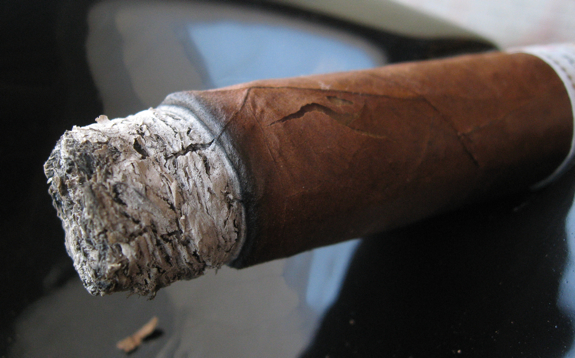 But a strong coffee would have overpowered the beginning of this cigar. This goes back to the whole unbalanced thing I mention above. I think this would have also paired well with a nice stout or tasty Amber beer. I am so not interested in this line of smokes…. Or any Reyes product as it stands. To me, it seems a bit steep in price for what you get. Only one of my locals carries their stuff, and it never seems to move. I don’t see the need t0 spend that $ on an iffy sticky- that is my sweetspot, I have at least five or six sticks I will immediately grab for that price point. To much competition at that PP. Just my two cents and that ain’t worth much. Thanks for the review D! Great cigars ! The price is also on point. I totally see what you mean Tadd. With the taxes in your area bringing these sticks up to $10 it’s sometimes better to stick to things you know and love. hopefully reviews like these help you figure out if it’s worth spending the money to give some new sticks a try (or not…). If there’s any other sticks you’re curious about let us know and Tony or myself can take a rummage through our humi’s to see if we have them.